The conditions and circumstances necessary for theatrical comedy were all present and accounted for at Friday night’s opening-night performance of Paul Slade Smith’s “Unnecessary Farce,” at the Shadowland Theatre conveniently located in downtown Ellenville. The show is a police drama involving the Scottish Mafia and detailing the events surrounding a hopelessly botched surveillance operation. To elevate the operation’s events to the level of farce requires the demanding hand of a master. For if there is one element of theatre that farce cannot be without, it is timing. Timing remains sine qua non, from the first day of blocking to opening night. And it lies in the demanding hands of the play’s director. It is the director who winds the clock! Brendan Burke is the artistic director of the Shadowland and for this masterpiece of dramatic farce he is the director, the timekeeper, the man who designs and implements the coordination of events. An arduous task for sure! But when one takes exceptional directorial talent with a value of 2 and adds it to remarkable acting talent, also with a value of 2, the sum is 5. Burke’s “Unnecessary Farce” lies in this category, as the whole is greater than the sum of its parts! Not to be taken lightly is the consequence of Bill Lelbach’s scenic design. The possible and probable effects of an invisible wall on an open stage are without limitation. It’s the next step in promoting the comedy to farce, as it allows the impractical and the improbable to become common place and serve as a causal factor in the sequence of events. Although, “Unnecessary Farce” does not rest in the traditional subgenre of bedroom farce, it does have a series of doors, essential to the humor as one character arrives and another exits and there are those who run about, clad only in their undergarments. Blain Smith brilliantly portrays Eric a bumbling, virginal, sexually deprived, rookie undercover police officer. Whose purpose, aside from securing evidence, is to shed his self-doubts and secure his own sense of masculinity. No more improbable a set of events are his actions and subsequent reactions resulting from his personal encounter with an over sexed, well-proportioned accountant Karen. It is an attractive Molly Densmore who is clever and quick-witted with the keen ability to portray Karen as the character whose intent is to excite and thrill the once innocent Eric. Accompanying Blain on his original mission, the collection of evidence, is a young, inexperienced policewoman in training. Susan Slotorff is exceptional in this role. Her ability to accentuate the ridiculous and accommodate the improbable makes this farce work. For her part the timing of the interactions with the other characters is critical, a significant portion taking place on the far side of an invisible wall. If she’s not in synch the humor is lost. But, not to worry. She has it and is the show’s delight. Further, appreciate the ability of other cast members, as each performs with the precision of trained trapeze artist on the high wire; they’re in one door, out the other. Slam! Bam! Oh, now a headache, too! Timing, timing, it’s all in the timing. Contributing to the total effect of this farce is Agent Frank. He is efficiently brought to life on stage by Torsten Hillhouse, whose experience assists in illuminating the nonsensical characteristics often peculiar to theatre’s special agents. 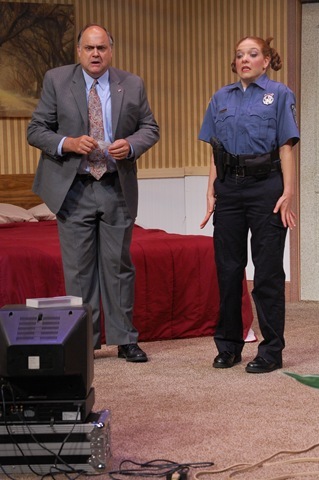 Mayor Meekly, as played by Ray Faiola and his wife Mrs. Meekly, portrayed by Sandy York are stage veterans who thoroughly understand the difficulties and the rewards of working and delivering a play with severe requirements. Their experience and knowledge of the theatrical presentations are a pleasure to observe. Finally, if one were to believe the play could not become more silly and absurd, there is, as mentioned, the Scottish Mafia. And, if by some remote chance, one is not familiar with the Scottish Mafia, its hit men carry bagpipes and play familiar Scottish melodies immediately preceding the elimination of a victim. This play’s hit man is John-Patrick Driscoll, a talented actor who fortunately has the physical prowess and finesse required to perform a number of demanding scenes with skill. And for the road, the play does have a plot, but it is not a necessary element, and it exists for the sole purpose of providing a time, place and reason for the absurd and unlikely. As though, an obscure and clever jester in a Shakespearean play, Ray Faiola, the mayor references the play’s circumstances, proclaiming, “That hardly passes for a plot!” Sit back; catch your breath and howl as the impractical and improbable unfold. 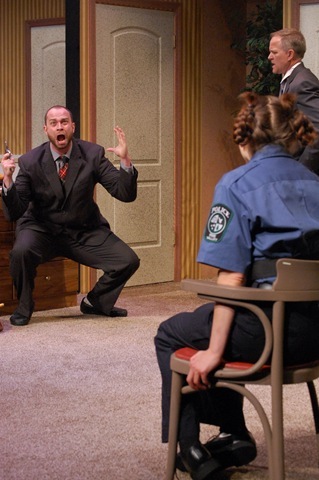 “Unnecessary Farce” will play at the Shadowland Theatre through August 3rd. http://www.shadowlandtheatre.org.